Finally, vacation day has arrived. You and your spouse have been planning this road trip for your entire family for months. You both take the time to research your destination and do all the necessary planning to make sure this vacation will be one to remember for years to come! The room reservations have been made, the activities have been carefully planned, your money carefully budgeted, and your packing was highly successful. Time was spent organizing the car efficiently, ensuring tissues, snacks, drinks, books, toys and Grandma’s crossword puzzles were packed. Your much needed rest and relaxation awaits you, the anticipation of sun and fun consumes your every thought. The only obstacle now, that stands between you and your destination, is the ever so exciting car road trip. Suddenly “it” happens, just a handful of miles down the road “it” begins. The vessel that is on a mission to transport you and your family to your vacation destination has now become the vessel from hell. It is certainly not exactly what you expected and most definitely not so soon. Crying toddlers, screaming preschoolers, fighting teenagers, and don’t forget upset grandma quietly taking it all in. How do you solve this chaos, and solve it quickly? That’s an easy one (for us) to answer! The solution is a DVD Player for your car, or possibly two. In this article, we are going to review the best DVD players for your vehicles, so you don’t have to. We will rank them below and will share with you exactly what you need to know that makes them stand out above all the rest. When the time comes, and you are ready to take that memorable road trip vacation, we assure you that you to be an educated consumer and ready to purchase one of the most important necessities for your vehicle. Let’s DVD review! Car DVD players have become dramatically more affordable in the past few years. With advanced technology and manufacturing quality, these Top 10 really caught our eyes, making them the best of the best. Screen size, visual quality, wireless remote & headphones, remote capability, and all around cost/value are the reasons these DVD players made our list. If you want to keep your child happy (and quiet) on long road trips or running quick errands, we recommend you own a DVD player for your vehicle! Less noise while driving, less stress while concentrating makes for an overall enjoyable safe driver and safe trip! Starting our list in number one position is the NAVISKAUTO 13" Car DVD Player with 10.1" DUAL high definition LCD screens. This portable car DVD player has phenomenal high definition picture quality and impeccable clear sound. Your passengers will love the 5 hour rechargeable battery for easy handheld use. Its sleek, thin design also makes it easy to install on the back headrest for those with "littles" that are strapped safely in their carseats for safety! If you have "littles" and find yourselves in the car traveling to sporting events, school, daycare, and roadtrips - you will love this product! This was an easy choice for us to make because these DVD players are simple to install on the headrest of most cars, trucks, campers, etc. For portability, it features a solid flip out mechanism so you can enjoy watching your favorite movies in the office, in bed on a nightstand, in the kitchen while preparing dinner, or just about anywhere. The smooth sleek design makes them easy to be carried in backpacks and overnight bags making them perfect for short trips via car or flights in the air! 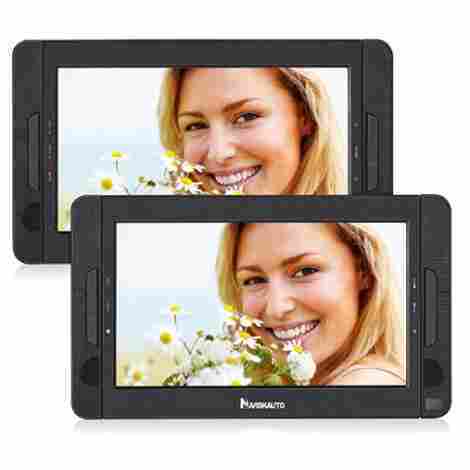 What do we like most in the DUAL 10.1 inch high definition LCD Screens? HIGH RESOLUTION! Both monitors have 1024*600 HD screens with LED backlight for extremely comfortable viewing. We believe eye safety to be number one, and less eye strain on all eyes watching makes for easy fun with less distraction from the kiddos in the back! These dual screens also allow for 1 or 2 movie viewing at once. Making this a smart buy for those families with 2 or more children. Build in speakers allow for crisp sound and included head jack that can be paired with most headphones. We strongly recommend shopping for that perfect comfortable fit for each individual. Young children will need something more lightweight for their little ears, and teenagers may want to go with a more durable leather-like comfort fitting pair of headphones gaming and music playing. For obvious reasons, this screamed number one for us! We love that it comes with two screens, quality construction, HD resolution, and large LED screens! It can play CDs and DVDs as well as most other digital media devices. Comes with SD Card slot and a USB port for gaming, pictures or just about anything you can think of. We love the price, we love the value and this is why this sleek player is number one on our list! Sliding in to our number 2 position on our top 10 list is DR.Q's 14.1" high definition DVD player. Children and adults alike will get hours of crystal clear entertainment from this system. 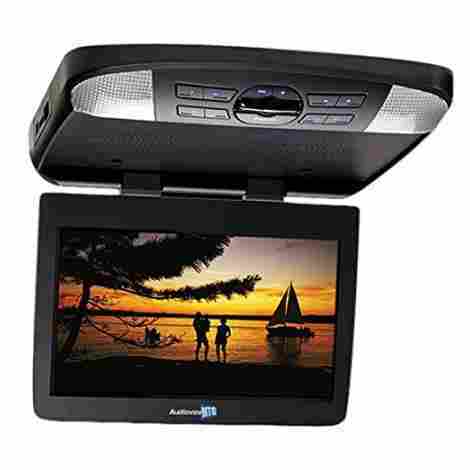 This versatile portable DVD player easily attaches to any headrest and boasts a 1280x800 swivel screen for comfortable viewing at all angles, making it a fantastic choice for your car, truck, camper or boat! Keep your family entertained on those long road trips! The quality is suberb, but it only comes with one screen - so if you have more than one child, you may want to purchase one for each headrest. If you are on a budget (and aren't we all), and can only afford one - we highly recommend this one due to the large crystal clear screen. Children can view it from all back passenger seats. The bags are packed and your funfilled road trip is about to begin. The "littles" have their backpacks with snacks, toys, and their favorite Dr. Q's portable DVD player. We really like the multiple power sources that this one has to offer. We love the five hour rechargeable battery if you are unavailble to reach a power soure. This system can be easily used in the 3rd row seating, in the bunk of an RV rolling down the Route 66, just about anywhere! Also included is a 5.9ft car charger which can easily reach the back passenger seat for hours of movie watching, music for your years, or cartoons for the "littles"! Comes with a AC adpater making this completely portable. We really like the dual stereo speakers in this upgraded system. The sound is loud, and sound quality is clear. Included is an audio jack to plug your headphones in for your private listening experience. Headphones are not included, but don't let that deter you from buying this product. Whether your are an adult or shopping for a small child - enjoy shopping for that perfect set of headphones for a more custom comfort listening experience. So much to offer with this great little DVD player. 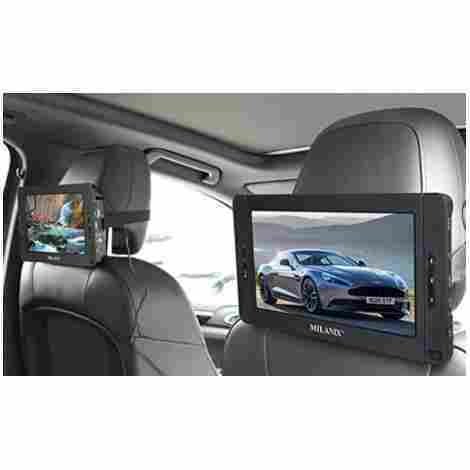 Effortless to install on any headrest, large crystal clear high definition screen and includes all the media capabilities that you may need on those vacation roadtrips! SD cards, USB port, DVD/CD , MP3 and most digital devices. Keeping in mind cost and value we think this is a fantastic buy for your vehicle, allowing for many years of quality viewing entertainment! Rounding out our top three is the IeGeek Portable Car DVD player. This player installs with ease on the back of any headrest or can be hand held for portability. If you travel often with "littles", this is a great,safe child friendly player. Compared to the others that we have reviewed for your today, it is slight smaller which allows for a perfect fit in the hands of small children. Durability, sleek design, and 360 swivel makes this an awesome system, especially if you need to purchase additional systems for the bigger families on the go! What do we like most about this model? The POWER! Unlike some models on our list, this model comes with numerous power sources. Come on, truth be told - the reason you are searching for a car DVD players is most likely because you have "littles". You know, the littles, the kiddos, the children. It's not shameful to admit that sometimes, while we are driving, we grown-ups would welcome a little peace and quiet while concentration on the road. Those of you with children, have you ever asked your children to "take it down a notch"? 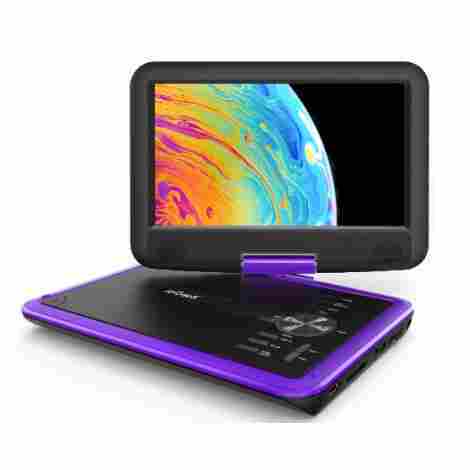 With three different power options, your child will never be bored or mischievous while using their portable DVD players, which is why we like this one so much! AC adapter, car charger and 5 hour rechargeable battery will surely keep them busy during their day to day commuting, and long road trips as well! This DVD player comes in a handful of different colors. If you are buying multiple players, you choose from 4 different colors. This player has 2 speakers, for maximum sound. HD eye protective screen to fight fatigue, buttons clearly marked making for easy use for those little fingers. For the cost, we really like what this ieGeek DVD player has to offer. Children love this one, keeping them entertained for hours on those long road trips or quick grocery store errands! Keep in mind, the cost is for one player only, which is why we love the cost and value on this one. if you have more than one child and need to buy a few, at this price it makes it very doable! Coming in at number 4 is the Rockville RTSVD921. It is the only dual HEADREST DVD players that made our list. That's right, the DVD player is actually built into the headrest themselves! These sleek 9-inch high-resolution touchscreen headrests use digital panels for crisp quality viewing. HDMI input compatibility for most external entertainment devices. Headrests are mostly universal, but check measurements to assure they will fit in your car. Nice aftermarket option for families that are not wanting that portable option like some of the others on our list. Two dynamic wireless headphones are included in this total package. These soft leather-like, lightweight headphones are designed for long-wearing comfort and can be folded for easy storage. These are dual channel headsets which means you can listen to different sources at the same time. For example, while little sister Tammy is watching Sesame Street, her big sister Cami can be watching Spongebob at the same time. Giving more options for children and adults of all ages. Give your kiddos something enjoyable to do while taking your next long road trip to Grandma and Grandpa's house, they will be happy that you did - and so will you! We really like how classy these dual headrests appear, no aftermarket look here! Beautiful HD touchscreen, quality sound, and easy to use make for a crisp quality picture! Give your backseat passengers a little entertainment for those long road trips! Although this is a little more pricey, we wanted to include it on our list because the quality is awesome, both picture and sound. 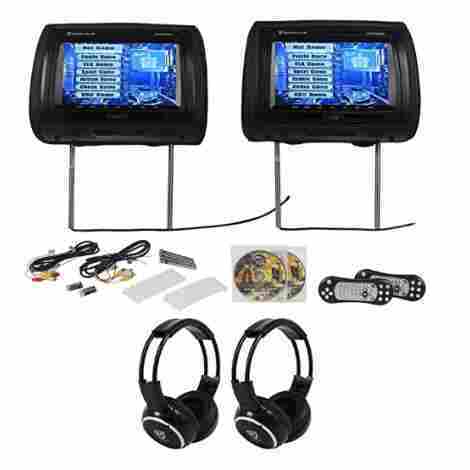 Smart workmanship shows in these headset DVD players. Included are nice slipcovers when monitors are not in use keeping them free on dust and spills. Based on quality and affordability, this makes it a great value in our book. It was imperative that we include this DVD player and it falls into fifth place on our list! This BOSS Audio BV9986BI is an alternative to the common portable and overhead type. This is the only in-dash, single DIN, Bluetooth, DVD, CD, and AM/FM receiver that made our list. This system boasts a sleek design as well as a front panel touchscreen that is both motorized and detachable. With its innovative graphic design and fine picture quality - it is no surprise we fell for this driver-friendly multi-purpose in-dash multi-digital system! Most new vehicles these days come with user-friendly, built-in touch screen electronic systems. So, we asked ourselves, "is there an alternate option for the car owner who cannot afford that crazy expensive automobile, SUV or truck with all the fancy buttons? How about the young and old fellas alike, that refuse to keep up with the Jones' and actually enjoys tinkering on their classic cars in their garages, maintaining their sweet ride with their sturdy and trusted mechanic tools? We are here to tell you, YES! Driver safety and accessibility is the reason we deemed this worthy in the top half of our list. We love the Bluetooth capabilities which make listening to music or playing a movie for your favorite co-pilot a breeze. No more fumbling for a DVD, your hands remain mostly on the wheel at all times. With one touch the driver can talk hands-free, making for a safer commute with little distractions. This is a nice hands-free, user-friendly Bluetooth DVD player for the driver wishing to purchase an aftermarket graphics display system. With 7 inch touchscreen and a detachable faceplate, we think this is a sound value with a great quality answer for that safety-minded driver. Two for One! 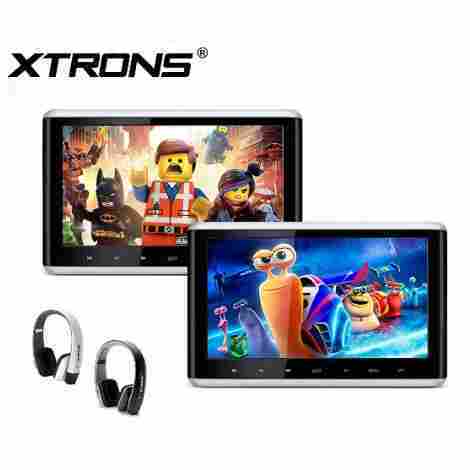 The Xtrons HD dual players! This was a fun product for us to review. Our staff really enjoyed the quality of these Xtrons dual DVD players. From the high definition digital 10.2" touchscreens to the multiple digital device capabilities it certainly makes this one of favorites for the cost. High definition crisp screens along with good wirelss headphones for the "littles" in your life! Enjoy that quiet roadtrip while giving the children something to do to pass the time! For the family that really enjoys gaming, this model has it all! Plays most CD//MP3s and also supports SD cards (8b Bit & 32 bit) and USB sticks for the gaming family to enjoy hours on the road or quality time at . Enjoy games, music, and pictures anywhere you chose. We really liked this adjustable feature alot. Different distances for different visual needs. Tilts up and down and side to side to give the viewer that perfect custom angle for hours of comfortable viewing pleasure. Perfect for children in car seats! This is a wonderful fun quality made product that will give both children and adults hours of entertainment during those long road trips. The high definition picture and 2 quality wireless headphones makes this a great value, and an investment for years to come! This is the highly talked about Audiovox 13HD. While reviewing DVD players, we included three overhead mounting systems to give our readers a few different options so when it comes time to buy, you are more knowledgeable and can make an educated decision! We really enjoyed the big 13.3" HD LCD screen with backlight to ease your eyes for daylight and nighttime viewing. With all of our overhead DVD players, unless you are a master installation tech or an electronic guru, we recommend professional installation to avoid the aggrevation, mistakes, and fuss. Go big or go home! We really like this 13.3" LCD monitor with backlight for a more crystal-clear viewing pleasure. This player does not swivel side to side, but does tilt up and down. 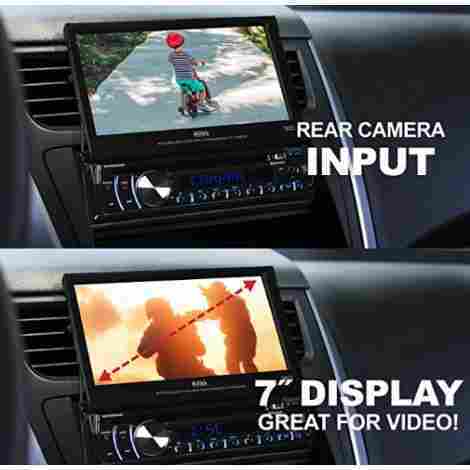 The larger screen and quality picture, however, allows for great viewing for all passengers in your vehicle. Enjoy your next road trip while watching your favorite movies, making the distance seem shorter for all! Similar to it's cousin that we reviewed further down on our list, it comes with 3 different colored covers. Black, pewter & shale (tan) to match the interior of most vehicles. This permanently mounted DVD player also includes a dome light so you are never left in the dark. We really like this model for it's nice design. This model includes all the bells and whistles to give you the most use of this model! HDMI/MHL to USB and SD slots for video, wireless connection, 16 channel FM transmitter, format capabilities for most media devices, all present and accounted for. Wireless headphones are recommended, but there is also a jack for wired headphones. Nothing is left out in this sweet piece of road gear! Milanix 10" stand in our eighth position. This DVD Player has crystal clear sound and picture and it mounts easily and securely on most headrests. For portability, it features a solid plastic flip out mechanism for the office, nightstand, kitchen, or just about anywhere. We really like the dual screens to allow for 1 or 2 movie viewing at once which makes this a smart buy for those families with 2 or more children. Can be paired with most headphones (but not bluetooth). No kiddos fighting over the channel clicker here! It has a 5 hour rechargeable battery and is made super thin so they look sleek on any backrest. We really like how portable these little dvd players are! They are built ultra sleek and are thin enough to fit into backpacks, overnight bags, diaper bags and purses. Never struggle with an antsy child again, when technology is at their fingertips. Headphones are not included, but can be purchased for those with children in tow. Overnight professionals may enjoy this model as well during those unexpected airport delays or boring hotel rooms while traveling on business. Incuded with your 10" dual DVD players are everything you need for the second viewer in your family! Two of everything! Two AC adapters, Two car chargers, two remote controls, and two headrest mounts. For the multiple "littles" in your car, this is sure to be double the fun! We really like this dual DVD player for the quality picture, nice sound and sleek design. We did, however, bump this DVD player down on our list, moving it to number 8 because it does not include headphones like some further up on our list. Please do not let the missing headphones deter your decision, as this is truly a quality buy for your buck! Positive headphone note: just as no two humans are alike, neither are headphones. It's nice to be able to shop for that perfect fit, and qualities that are important to you. Your children will certainly get a kick out of shopping for headphones with you! Our number 9 pick is the Audiovox overhead mounted DVD player for a few great reasons. 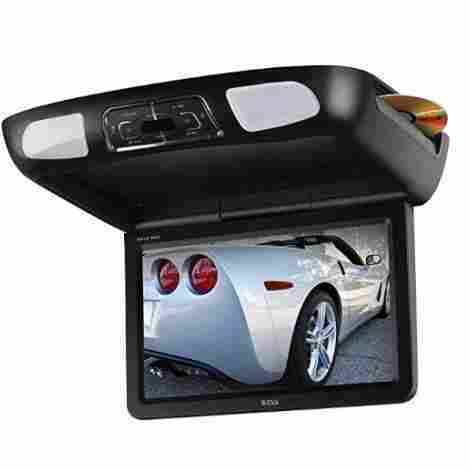 We really like the interchangeable ring and covers (black/shale/pewter) and we mention it here because we feel it is an important option to have when considering an overhead mounted DVD player. Choose the best color to match the interior of your vehicle and be the envy of all your friends. This Audiovox DVD player features AV Input/Output, USB, SD Card Slot. This model also comes with two wireless headphones and additional headphones can be purchased for larger families. Give your backseat children and passengers quality sound and viewing entertainment with this DVD player. This overhead mounting system will pacify your passengers with their favorite movies or tv shows. Also, for the teenagers and adults, there is an option to connect their personal media devices for hours of music pleasure. Entertain your rear seat travelers with their favorite movies or content from their personal media devices. 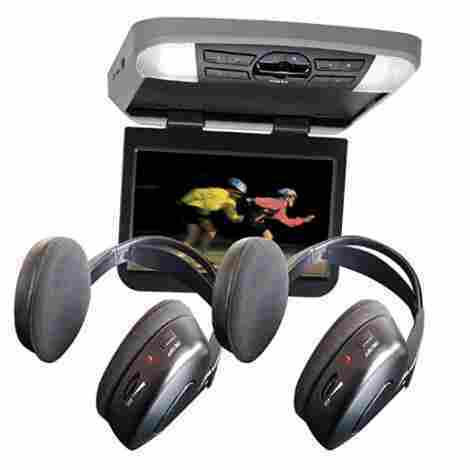 We really like the dual channel wireless headphones, it's a must when purchasing a car DVD player. Children remain quiet while watching their favorite movies, tv shows, or listening to their favorite music connected via their media devices. Allowing for a quiet road trip for that front seat driver who can listen to their own genre of music. Less chaos in the backseat allows for peaceful driving in the front seat. There is an available optional wireless digital transfer capability from your smartphone or tablet via the smart stream module. Want to watch Netflix or Amazon Prime Video on the road? This is the way to do it. You can't get much more flexible than being able to watch DVDs or streaming video at the click of a button. You'll love having the choice! This multi-use DVD monitor can be used for a number of different options and gaming devices. This is mounted on the ceiling of your vehicle with a flip down mechanism, replacing the existing dome light. Included are 3 covers that come in gray, tan, and black to match the interior of most cars. This player has a 30-degree swivel for your child's viewing pleasure. We liked this affordable option for our buyers as it also comes with 2 wireless remote headphones, allowing for no tangled wires and keeping your children safe and quiet while watching their favorite shows. Did we mention this DVD player comes with two wireless headphones? That's right, no more distracted drivers from loud movies and silly sing-a-long songs when your children put their headphones on. It also comes with a wireless remote with simple functioning buttons for the older children in your car or the adult in the front seat. This player also has a 30 degree swivel for the exact angle your child needs for optimal viewing. Just a slight swivel in either direction allows for a clear no glare picture. It's amazing what a little adjustment can do to increase your kids' satisfaction. We all know that sometimes a small accommodation for your child can mean miles and hours of motoring pleasure. The BOSS audio BV10.1MC is a unique entry on our list! Designed to fit in your car like it was installed at the factory, it will provide the utility you want, entertainment for your backseat passengers, and comes with a set of wireless IR headphones, too! The cost of this complete, custom-looking installation is very reasonable for the value and capability you are getting. You will not be disappointed in the BOSS BV10.1MC. Choosing the criteria used for selecting our Top 10 Car DVD Players was a bit difficult. With today’s technology, there are virtually thousands of different companies making DVD players. We are happy to share with you today that we successfully embraced this challenge and now bring to you a well-rounded list of what we believe to be… the best of the best! We felt it imperative to our readers to include a few different styles which give you a variety of options for every budget and every need. Just like no two vehicles are alike, neither are the people who drive them, or the specific family wants and needs when purchasing a car DVD player. Let’s take a look. Let’s admit, most people purchase car DVD players to keep their children occupied and quiet while sitting in the backseat. Allowing the driverless distraction and more concentration while keeping their loved ones safe on the road. We realize that watching a smaller screen will never be cinema quality in your car, but the picture and sound quality is out there! Smaller screens work well with the “littles”, making them easy to watch and use while being strapped safely in their car seats. The larger screens with crisp high definition picture, dual speakers and LED backlight are perfect for a headrest. Giving the passenger a more complete visual viewing experience from most seats. We reviewed four different placement options for car DVD players. Although this criterion was important to us, we feel that priority placement is determined by what is best needed for each individual family. We really liked the nice clean look of an overhead permanent model which includes a dome light. The sleek designs give them a nice classy look to all vehicles and include 3 different color options to match the interior of your car nicely. Although instructions are included, if you are mechanically challenged, we do recommend professional installation. Headrest built-in DVD players was a great option as well, but check install measurements before purchasing. They present nice visual appearance and does not look at all like an aftermarket purchase. The portable DVD players are very popular and seem to be purchased the most. The versatility is grand and then allows the option to take your DVD player just about anywhere. These models install effortlessly on to the back headrests and can be removed for children for a nice handheld option. All come with a flip clip to support your device for watching just about anywhere you can imagine! AC Adapters, 5-hour rechargeable batteries, and portable car chargers are the sources we reviewed. Never be without power again, allowing for hours of viewing and listening enjoyment for those backseat passengers. Extra accessories always impress us. The total package, everything you need to enjoy your car DVD player right out of the box! We love models that included wireless headphones and carrying cases. Makes traveling a breeze from house to car, from car to airport, from airport to your destination! Keeping your investment safe, clearly accessible to your “littles” and making for a less stressful traveling experience. Most come with AC adapters, long car chargers and most have a 5 hour built-in rechargeable battery include remote controls. Our final criteria in determining the best of the best were cost and value. Are you getting a well-built DVD player, at an acceptable cost? With this top 10 list, we can assure you YES – you are! When factoring in costs with all the bells and whistles, headphones, accessories, etc., you can’t go wrong with any one of the Top 10 we have reviewed for you today! Q: Are the overhead mounted DVD players hard to install? A: They could be. If you are not a mechanic guru, we do recommend having your system professionally installed. All systems do come with everything you need to install; including wires, plates, screws and most importantly – instructions. With the perfect install, we assure you it will not look like an aftermarket purchase! Q: Can I use these car DVD players in my home or office? A: Certain ones, absolutely. For obvious reasons, the overhead player should not be uninstalled. But, for the portable DVD players, that is exactly what they are made for. They can easily be attached to the headrests with straps provided. When using them elsewhere, simply unstrap them from the seats and they are ready to go. They come with a great flip-out stand feature so you can watch movies just about anywhere. Multiple power sources are included with most, AC adapters for the wall, car chargers and some even come with a built in 5 hour rechargeable battery! We really like those the most! Q: Do I need to buy headphones? A: Yes, and no. Watch carefully when purchasing Car DVD players as some of them do indeed come with headphones. That can certainly be a bonus for some consumers. Yet, other consumers would rather purchase their headphones themselves to ensure more of custom sizeable fit for maximum comfort!